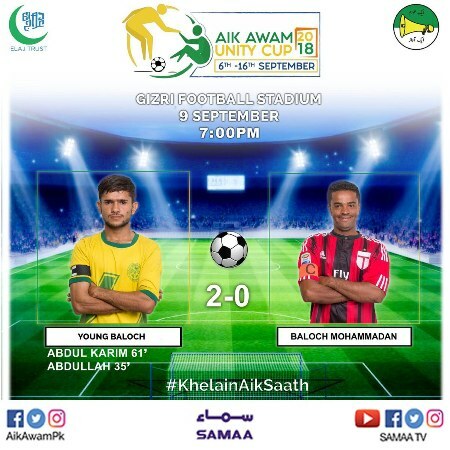 The Round of 16 stage in the inaugural edition of the Aik Awam Unity Cup came to an end as four more teams have secured their place in the quarterfinals. 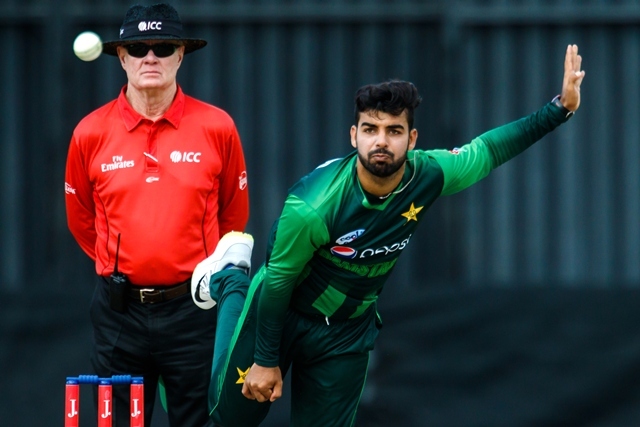 The Lyari Brothers, Gizri Star, Young Baloch and Tanzeem Sports won their respective eliminators on Sunday evening at the Gizri Playground. The Lyari Brothers knocked out the Shireen Jinnah Superstars in the first game of the day. 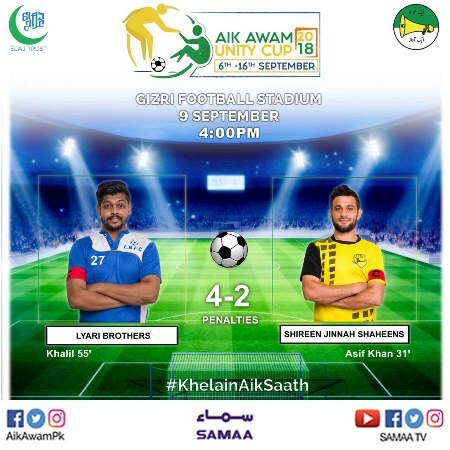 The superstars were leading in the first half thanks to a goal by Asif Khan in the 31st minute. Khalil made it 1-1 in the 55th minute. 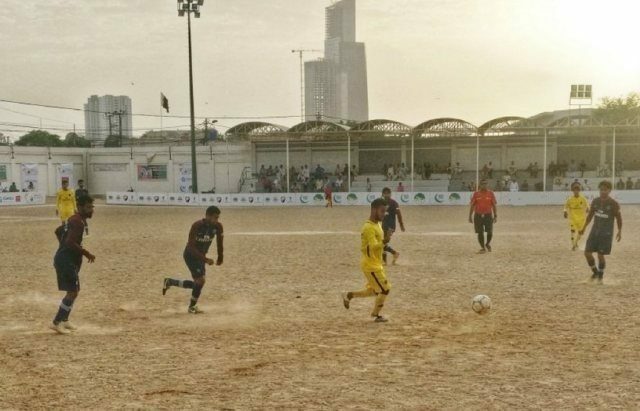 The match was decided on penalties and it was the Lyari side which won the fixture by 4-2. The second fixture of the day saw Gizri Star in action against Lyari Baloch. Usman provided the early lead to the Stars as he scored the goal in the fourth minute. However, Yasir made it 1-1 just five minutes before the half-time whistle. No side could break the deadlock and the match was decided on penalties. Gizri manage to win the match by 4-3. Young Baloch defeated Baloch Mohammadan 2-0 in the third match of the day. Abdullah made it 1-0 in the 35th minute and Abdul Karim scored the second goal in the 61st minute. Tanzeem Sports defeated Young Eid Gah on penalty kicks in the final Round of 16 match. 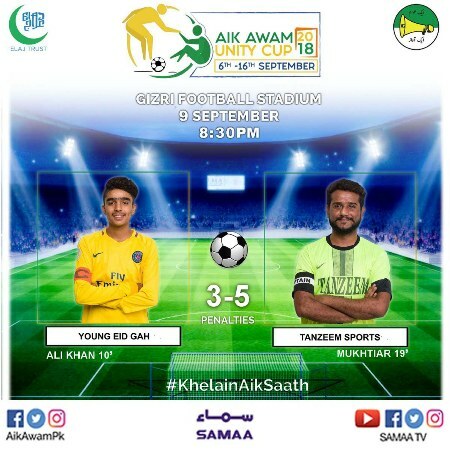 Young Eid Gah took the lead in the 10th minute as Ali Khan netted the ball. Mukhtiar made it 1-1 nine minutes later. Tanzeem side managed to overcome the opposition and won the game 5-3. Al Wajid, Young Meeran, National Fighters and Light of Baloch have already qualified for the quarter finals of the tournament. The quarterfinals will be played on Tuesday, September 11. 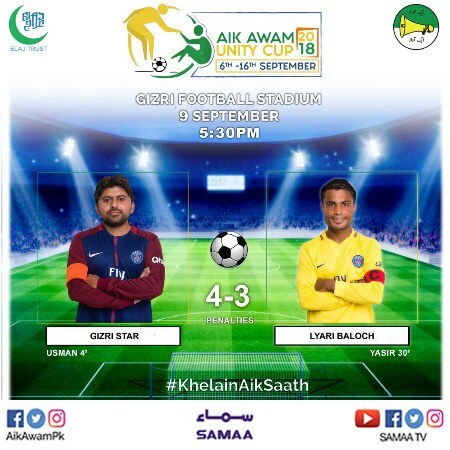 The Aik Awam Unity Cup is being organised by the Elaj Trust and Aik Awam Movement to commemorate Defence Day and pay tribute to the footballers of the country. Teams registered under the Sindh Football Association are taking part in the event. The winning team will get a cash prize of Rs100,000 while the runners-up will be awarded Rs50,000. The teams which finish in third and fourth place will be awarded Rs25,000 each. The winners of the player of the tournament, golden boot and golden glove awards will be awarded Rs15,000. SAMAA Digital is the official media partner of the event.